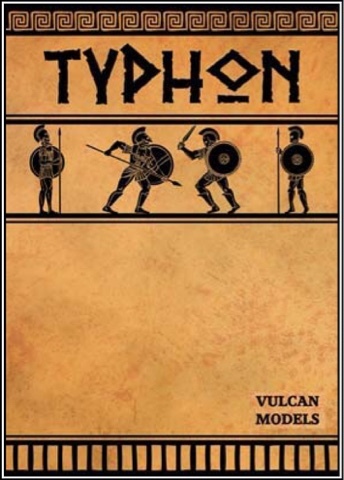 Typhon is Alternative Armies' game of skirmishes and heroism during the time of Greek Myth. Players lead a band of Heroes, Shades of Hades or Mythical Monsters in legendary battles, calling on their patron gods to aid them and hopefully surviving enough encounters to grow into a hero worthy of being remembered for generations to come! 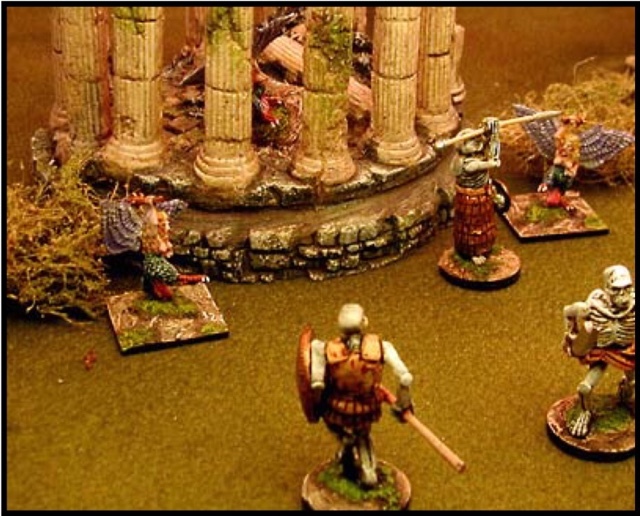 Mechanically, the rules are similar to the Darkestorme fantasy skirmish rules (which I have looked at here), but are modified to both suit the period and improve on the aforementioned publication. The book itself is an A4, spiral bound tome of 78 pages with clear plastic covers front and back. It's actually quite nice to have a book that lies flat on the table with no need to bend it back or break its spine! Opening the book, the reader is greeted by a map of Ancient Greece, a brief overview of the game and a generous background of 12 pages outlining the myths and legends of Greece. Useful if you are new to the period or want a quick overview. Following the introduction are the rules of play, how to create your hero and his followers, advice on scenario creation, an extensive list of powers and gifts, stats for warriors and the monsters they may face, a set of three scenarios and finally record sheets for your heroic band. The core rules are relatively simple in their execution. Characters have two or three actions per turn, which can be used to move, fight, use a god power or carry out other tasks suitable to the scenario. To attack a foe requires a 2d6 roll meeting or exceeding the attacker's 'To Wound' score (usually between 6 and 9). If hit, the defender can make a Resist Wound roll in a similar way. Where these rules differ to Darkestorme (and are much better, in my opinion) are the way shields, armour and wounds are handled. If a character carries a Hoplite Shield, he may use it to block the attack. This requires a 2d6 roll and can result in the attack being negated or reduced in strength, or the shield becoming damaged or broken. Other shields merely provide a modifier to Resist Wound rolls and this provides a neat way to differentiate Greek Heroes and their ability to shield against attacks. This is also a more interesting roll to make than your typical d6 roll against a target number. Armour works in a similar way, with a 2d6 roll on a table. My favourite entry is the roll of a 12 breaking the attacker's weapon! Other results allow various degrees of stopping power or damage to the armour. Both this and the results of using a Hoplite Shield can give a range of modifiers to the defender's Resist Wound roll. In my opinion this is more interesting to play out than the rules in Darkestorme, but of course it is a little more time consuming. This level of detail is a welcome addition to rules more geared towards skirmishes with only a few figures on each side though. And from a game play perspective it is enjoyable to have the excitement of these rules (usually accompanied by cheers or groans depending on the outcome!). If an attack scores a wound a roll is required to find out the effect. Monsters just have a flat number of wounds and are defeated if reduced to zero. Characters in Typhon , however, have no such thing! Instead they might be killed outright, mortally wounded and need the assistance of their fellows, avoid the wound entirely, or receive a flesh wound which gives a penalty to future rolls on the table. The table is weighted towards the character being out of the game, but as two of these options allow for the character to return to future games if his side wins, it greatly adds to the tension of the remaining battle! Additional rules for combat provide for the use of missile weapons, using two weapons at once, having a terrain advantage and making sweeping attacks which can target more than one foe. Your Hero also has access to Fate points, which can be used to modify initiative rolls or force re-rolls by your opponent. God powers are a major part of the game, so I thought they deserved their own section in this review! When you create a hero, you choose a patron god which allows the hero to have access to that god's powers in addition to a generic set of gifts that heroes can choose from. Six gods have powers listed in the rule book (two more are available as free PDFs from the publisher). Each god has seven powers of varying potency, reflected in the amount of fate points required to 'buy' them. The generic list of gifts contains an additional 29 powers, for a total of 71! It is quite a list and very thematic compared to your usual list of skills and abilities, serving to reflect how important the gods and their patronage was to the Greek heroes. All of these gifts are classified as either Items, Powers or Creatures. Generally speaking, Items have an ongoing effect for the whole game, Powers can be used once per game for their effect and Creatures represent some kind of summoning ability which results in the summoned entity coming into play for a certain number of turns or for the whole scenario depending on how powerful they are. All of the powers really enhance the theme of the game and it add a great variety to the Heroes in the game as well as an interesting decisions in campaigns about whether to gather several minor powers or save up for some of the more powerful ones. Before playing, you need to create your band of Heroes, or if you are so inclined, your drove of Shades from Hades. This is a pretty straight forward process. You start with 50 fate points and with these you need to select your Hero and his god powers. A minimum of 40% of your fate points also have to be spent on Champions and Fighters to follow your hero. Costs for all characters vary depending on if you choose Youth, Man, or Aged characters, each of which have a different stat line and differing advantages and disadvantages along with it. Shades are worked out similarly, but have a choice of being Lesser or Greater rather than the three ages. Once you have chosen your band, you receive a random number of coin with which to purchase weapons and armour, as well as other useful items for campaign games. The campaign rules as presented in the book are quite a simple affair. Your Hero and Champions gain Fate Points by defeating enemies, winning scenarios and so forth. These can be kept to spend during the game, or used to buy new god powers. You can buy new warriors to join your band or, if they have proven themselves, advance a Champion to the class of Hero. A selection of monsters, most well known from Greek Myths and some less well known, have rules provided in the book. You can also get free PDFs of additional ones from the publisher. These are fearsome foes indeed and suitably challenging for experienced bands of warriors. As well as the kind of stats you might expect from such monsters, they also come with unique abilities that really capture their individual 'flavour'. In a very nice touch, defeating certain monsters allows a Hero to benefit in some way, for example using the teeth of the Cadmus Dragon to raise undead warriors, or the head of a Gorgon to turn enemies to stone. 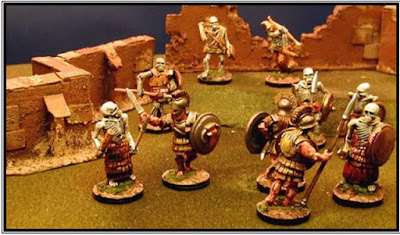 This is a review of the rules, not of figures, but it is worth pointing out that Alternative Armies stock a range of 'Heroic Scale' figures to accompany these rules, nominally 50mm but I think some 42mm ranges would be compatible (although I have yet to verify this). Of course, you can use whatever range of figures you want with the rules, but I find these have a certain charm about them that I find very appealing. The picture below shows two Typhon figures next to the silhouette of a 28mm Flintloque miniature. These rules take mechanics from a generic fantasy skirmish game and, with the odd tweak and adjustment, turn them into something that feels quite different. In fact I'd have to say I prefer them to the set they were based on. At their core, the mechanics are pretty simple, but there is so much flavour layered on top that it doesn't feel this is detrimental when playing. I can't say I have played other rule sets for the 'period', otherwise I could offer some kind of comparison. But what I can say is that I don't feel the need to rush out and buy any others! I would like to see the rules supported by a more comprehensive figure range (there are some god powers that summon monsters not currently available) and perhaps the main drawback is a lack of fully fledged campaign rules, but these are not insurmountable problems. I thoroughly enjoy Typhon and would recommend it to people looking to recreate Mythic skirmishes with a small number of figures. The rules are easy to pick up and play or teach but with a good deal of variety and fun to be had. 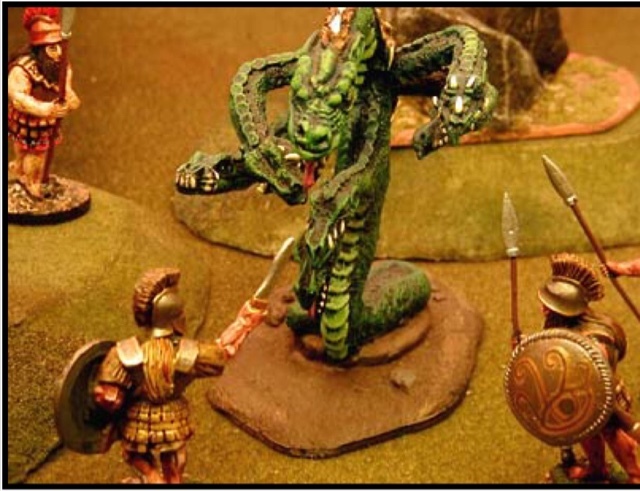 (All pictures are taken from the Typhon overview PDF, free from Alternative Armies). 1.) The rules have the exact level of "crunchiness" I'd like for a small skirmish game; detailed but not clumsy, with plenty of suspense for the players. 2.) The God Powers are extremely creative and really give a good feel for the genre. The author definitely knows his myths, and it shows in the rules. 3.) If anybody picks these up, I too would strongly recommend they get in touch with Mr. Symes at AA and ask him to send on those pdfs. It's a bit of a shame they didn't make it into the rulebook, but that's only a very minor quibble and is easily fixed. 4.) The figures are great fun. The added size really suits the game and I'd highly recommend taking a good look at them. They are full of character and lots of fun to paint. It is true there are some gaps in the range, but there is more than enough to work with for the time being. I particularly like the monsters! Thank you for the in-depth review. This is a game that has coasted somewhat under the radar in the past, which is a shame, as it's clever, has just the right amount of detail, and has a lot of potential for extended campaigns as heroes and their retinues advance to take on greater and greater dangers. I think anyone interested in gaming the Greek myths would not be disappointed. You've certainly inspired me to get cracking on my own collection! Pleased you liked it, Daryl. Good luck with your project. If you ever want to put some pictures or game reports for it on the web, I'd be happy for you to do a 'guest post' on my blog if you like! The more vocal fans the better! It's a highly enjoyable game! I have the game myself and still found your comments interesting and informative. You're welcome, Tony. I'm pleased you enjoyed it. Hi Chris what pdf are available for Typhon? I just got the set and noticed no rules for Gorgon, Nemean Lion, etc.. 2 new god power lists? Athena I hope. Sorry for the late reply, I've only just seen your comment. If you email Alternative Armies they will send you a whole swathe of PDFs which contain rules for the whole range and god powers for Athena and Hermes.